Dr. Ellery Frahm is an archaeological scientist who teaches and conducts research in both the field and the laboratory. 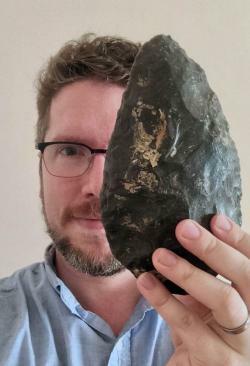 He has conducted and published research on four continents – Europe, Asia, Africa, and North America – spanning nearly half a million years of human history across the globe. He studied Physics and Anthropology at Grinnell College, a liberal arts college in central Iowa. His Master’s degree in Interdisciplinary Archaeological Studies at the University of Minnesota explored the Old Copper complex of the American Midwest, and his doctorate in Anthropology from the same institution examined mobility and trade in the Near East during the Early to Middle Bronze Age transition. As a Marie Curie fellow at the University of Sheffield in England, he developed scientific approaches to the study of Eastern Mediterranean material culture with the NARNIA (New Archaeological Research Network for Integrating Approaches to Ancient Material Studies) Project. Since 2010, his research has focused on the Caucasus, specifically Armenia and Georgia, although his other recent projects span from Minnesota to Kenya. At Yale, he teaches courses including Introduction to Archaeological Laboratory Sciences and Introduction to Experimental Archaeology. He also works with students on their projects, from the initial research design to presenting and publishing their findings.